The Northern Hemisphere of the planet Earth has a very special star. 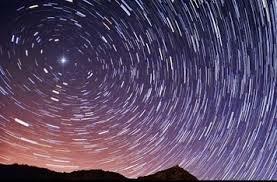 Polaris, also known as the North Star, sits almost exactly over the axis point of Earth’s rotation. Anyone, looking into a clear night sky, can determine the direction North – no matter what the season, no matter what the time of night. 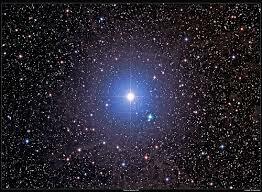 One ancient name for Polaris was Cynosūra, from the Greek word meaning "the dog’s tail" (reflecting a time when the constellation of Ursa Minor "Little Bear" was taken to represent a dog), hence the English word cynosure. Most other names are directly tied to its role as pole star. In English, it was known as "pole star" or "north star"; in Spenser, also "steadfast star". An older English name, attested since the 14th century, is lodestar "guiding star", similar in meaning to the old German and Old Norse names. The name Polaris in English goes back to the 17th century (just before the pirates; time). It is a contraction for the Latin stella polaris "pole star". 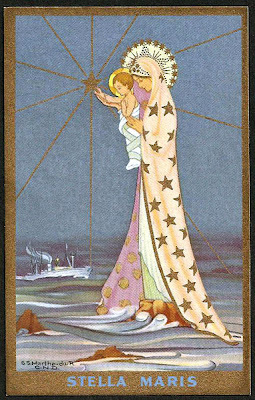 Another Latin name is stella maris "sea-star" denoting its importance to sailors. Stella Maris was also used as a title of the Blessed Virgin Mary, popularized in the hymn Ave Maris Stella –from the 8th century. Navigation by the stars – celestial navigation – is believed to have started in the trackless wilderness of Earth’s deserts, and was almost immediately adopted by fledgling mariners. The sea is a treacherous place to travel. Not only are there no landmarks (land-marks) but the water is constantly moving – often not going the direction that a sailor wants to go. Sailing against a strong current could – and in the early days of sail, actually did – mean a ship was actually traveling backwards. Add to this that the wind rarely blew in the direction a ship needed in order to sail, and it’s easy to see why navigation was a tricky matter at best. Without instruments, it’s possible to figure an approximate location at sea by using ded reckoning. This was done with a peg-board, marking the approximate forward motion, the amount of drift, and the direction of travel, including changes of direction made during the day. This method allowed an approximate location to be determined. But it was a matter of instinct as much as intelligence. Many of the calculations involved in ded reckoning were felt as much as known. 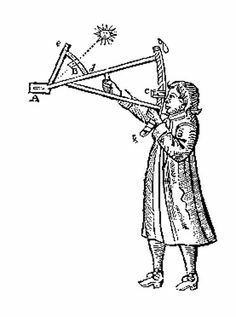 Celestial navigation involved MATH, and it involved instruments. During the Golden Age of Piracy, only latitude (the distance from the North Pole, shown on globes as a series of rings, the most recognizable of which is the Equator) could be accurately determined at sea. In order to find a given point, such as an island, the navigator tried to put the ship on track along a given longitude, then “run down the line” until the desired location was achieved. 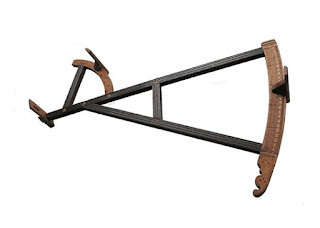 During the Golden Age, the most advanced instrument in common use was the Davis Quadrant. The device used to measure – in degrees – the distance from the horizon of a celestial body. If, for instance, Polaris is ten degrees from the horizon, he is about ten degrees north of the equator. The method requires that a couple of conditions be met. For one thing, it requires a clear view of both the North Star and the horizon. It also requires that the navigator be somewhere north of the equator. On the southern side of the equator, Polaris is not visible, and there is no southern pole star. The other method of celestial navigation uses the sun. 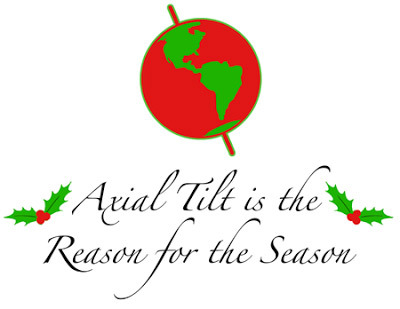 If the exact position of the sun is calculated, relevant to the horizon, at exactly noon, the angle by which the sun’s position deviates from 90 degrees can be used to reveal the latitude. Using the right equipment, it’s a slightly more accurate measurement – and accuracy is important, especially when you’re all alone on the deep blue sea, looking for land. Eventually, the invention of the sextant made latitude calculation even more exact. Longitude can be measured in the same way. 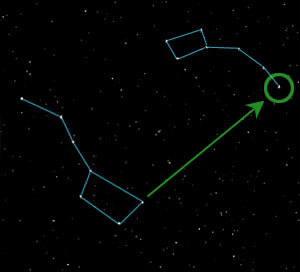 If one can accurately measure the angle to Polaris, a similar measurement to a star near the eastern or western horizons will provide the longitude. The problem is that the Earth turns 15 degrees per hour, so these measurements depend on time. A measure a few minutes before or after the same measure the day before creates serious navigation errors. The invention of the modern chronometer by John Harrison in 1761 vastly simplified longitudinal calculation. Of course, modern navigation relies not on the stars, but on GPS positioning. Satellites in geo-stable orbits over the earth’s surface send signals that can be used to determine the exact position of a ship at sea or a car whose driver wants to find the nearest Burger King. Technology has enabled navigation so precise that for a time, celestial navigation was no longer taught by the US Navy. But navigation by the stars is making a come-back. The computers may break down, the satellites may even be shot down, but the stars will always be with us. The stars can be our guides until the end of time. Heaven Bless all my readers, Happy Winter Solstice, and a Merry Christmas.